Outdoor flooring is very different from indoor flooring. The former is exposed to the elements and sees more wear and tear than the latter. And so, it goes without saying that you need to make extra certain that the materials you choose for the landscaped areas are weather-resistant and long-lasting. When you are planning on getting a patio or deck floor installed, consider outdoor tiling as an option. We at Rou Pavers are one of the leading companies in the hardscaping space and have created a distinct niche for ourselves in the industry. Our company has handled a significant number of residential tiling projects for clients in and around Pensacola, Golf Breeze, Pace, and Milton. Our experts have designed and constructed impressive outdoor tiled surfaces on properties in Navarre, Navarre Beach, as well as Pensacola Beach. We are ICPI-certified installers and clients from across Fort Walton Beach, Baldwin County and the surrounding areas trust only us for all their hardscaping requirements. Some people opt for pavers made of brick, concrete or natural stone, while others prefer poured concrete surfaces for their yard spaces; but tiled outdoor flooring looks distinctive and adds to the aesthetics of your property. Easy to Maintain - When you hire us for tile floor installation, our experts recommend the use of glazed, glossy, matte or textured tiles. Depending on where they are being installed, these tiles can be vacuumed, pressure-cleaned and mopped. Tile surfaces are non-porous and this makes them ideal for areas like patios, decks and outdoor kitchens as well as pool houses and more. Moss and Mildew-Resistant - Some of the major concerns that most property owners have when it comes to maintenance of the outdoor spaces are moss and mildew. Good quality tiling repels moss and mildew. In addition, since the surfaces are non-porous, they don’t allow microorganisms to harbor in them; this makes them the perfect choice for semi-enclosed outdoor spaces too. Durable - When we handle the job, you can rest assured that only the top quality, weather-resistant outdoor tile flooring materials will be used in the work. Vitreous tiles resist scratches and you can also move heavy outdoor furniture across them without worrying about them becoming damaged. Cost-Effective - These materials prove to be very cost-effective because they provide years of trouble-free service and their cost of ownership is very low. You will also find there are a large variety of tiles to choose from and can easily find something that fits into your budget. 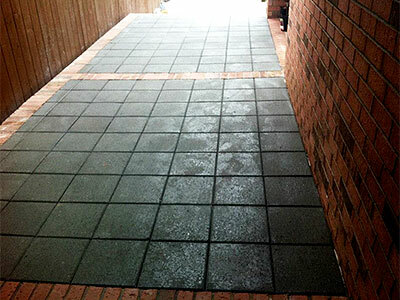 We make sure that you get the best outdoor tiling products and installation services. Regardless of whether you want a large deck tiled or your patio tile installation done, you are assured of the best services at all times. If you are looking for tile installation contractors that will cater to your specific needs and give form to your ideas, we are the company to come to. For any more information on our services and tile installation cost, feel free to contact Rou Pavers at 850-791-5641. You can send us your project details via this Contact Us form or request a free estimate and one of our experts will get in touch with you shortly.